The Permanent Structured Cooperation: A step forward towards a European common defence? On 13th November, Ministers of Foreign Affairs and Defence Ministers of the European Union met under the direction of the High Representative for Foreign Affairs and Security Policy (HR/VP) Federica Mogherini to sign the agreement that laid the foundation of a deeper cooperation concerning security issues among EU countries. This agreement, called Permanent Structured Cooperation (PESCO), has been considered an important step forward towards a common European defence system. On 28th June 2016 Ms. Mogherini released a 60-page document titled ‘European Union Global Strategy’ (EUGS) which dealt with the most important aspects of the future European diplomatic strategy on a global scale. This document focused on aspects such as the need for a stronger EU in the world, capable of countering any crisis on a global scale, not only adopting soft-power resolutions, but also being able to rely upon military means. This new global strategy aimed to promote and defend European values, as much as the interests of European population and countries, focusing on ‘the ambition of strategic autonomy for the European Union’. From a military point of view, this document proposed a stronger military cooperation among EU countries; on the other side, it confirmed European transatlantic perspective and the role of NATO as the most important partner. 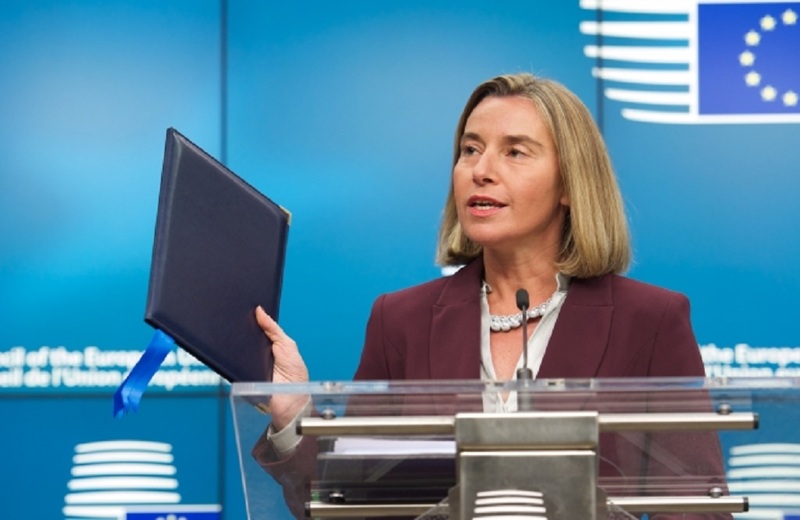 Commenting on this document, former Director of Carnegie Europe Jan Techau underlined the importance of Mogherini’s proposal; nonetheless, he affirmed that for the future to come, EU diplomacy and security will be in a relationship of dependence with the USA. On 14th November 2016, a few months after having issued the EUGS document, Ms. Mogherini’s department issued the implementation plan for the EUGS in the area of security and defence. This document aimed to establish the most important principles and concrete objectives and means for the common European defence, as the decision-making process to counter an international crisis, how to fund a common defence, and how to create a common European military industry. In the European External Action Service factsheet regarding PESCO, issued in October 2017, PESCO is described as being “a Treaty-based framework and process to deepen defence cooperation amongst EU Member States who are capable and willing to do so.” PESCO is the result of a common work among EU countries that laid down a list of common commitments regarding defence investments, capability development, and operational readiness. Taking this list into consideration, each country willing to join PESCO sent a notification to the HR/VP declaring its capability and commitment to “fulfil the requirements of a permanent structured cooperation in the field of defence.” On this basis, PESCO was signed by the Foreign Affairs and Defence Ministers of 23 EU countries, i.e., all but Denmark, Ireland, Malta, and Portugal, while the UK is excluded, as it is in the process of leaving the EU. In the document ‘Notification on permanent structured cooperation to the Council and to the High Representative for Foreign Affairs and Security Policy’ PESCO is formulated as being “an ambitious, binding and inclusive European legal framework for investments in the security and defence of the EU’s territory and its citizens” and it aims to coordinate the defence capabilities of the EU countries taking part in it. Furthermore, PESCO’s goal is to define and orientate the common European defence within the broader framework of European institutions such as the European Defence Agency, the European External Action Service, and the Common Security and Defence Policy framework under the HR/VP. The international press generally considered the creation of PESCO as a step forward towards a common European defence project, or even towards a common European army.